GREEN BAY — After a week of questions and concerns, the Packers offensive line is remaining intact for Sunday night’s game vs. the Bears. Starting guards Josh Sitton (toe) and T.J. Lang (ankle) were both listed as questionable on the injury report but are active and will start. By staying in the lineup, Sitton will be starting his 48th consecutive game, including playoffs, and his 96th in the last 98 contests. For Lang, this will be his 60th start in the Packers’ last 61 games, including playoffs. On defense, safety Morgan Burnett is also active and will start. Burnett missed the Packers’ last game two weeks ago with a calf injury and was downgraded from probable to questionable on Saturday. But he is back in the lineup, along with cornerback Sam Shields, allowing the Packers to have their full starting secondary for the first time since the Miami game a month ago. For the Bears, TE Martellus Bennett, who was listed as questionable, is active and will start. Bennett had a career day in the first meeting with the Packers this season, with nine catches for 134 yards. NFC North update: For the third straight game, the Lions pulled out a win in the final moments, this time beating the Dolphins 20-16 on a TD pass with 29 seconds left on Sunday in Detroit. That improved the Lions to 7-2, meaning the Packers must win tonight to stay one game behind Detroit in the division standings. A loss would give the Lions a two-game lead with seven to play. Weather: Temperatures are expected to be in the low 30s throughout the game with very light winds. Storms could be coming to the Green Bay area on Monday but are not expected on Sunday night. After the bye: The Packers and Bears are both coming off their bye week. Green Bay is 7-1 after the bye under Head Coach Mike McCarthy, including five straight wins. 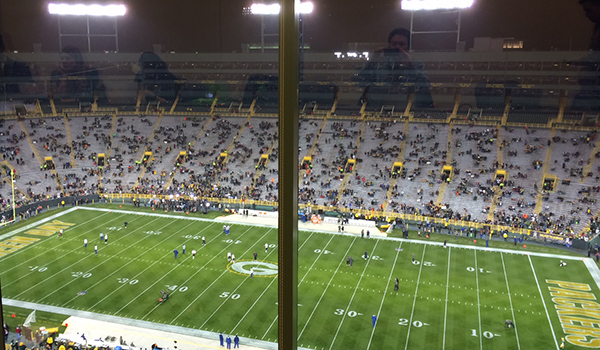 Tonight’s game begins a stretch of four games in five weeks at Lambeau Field for the Packers. Second meeting: The first time the Packers and Bears met up this season, six weeks ago, the Packers won, beginning a stretch of four losses in five games for the Bears prior to their bye. Green Bay’s win, a 38-17 triumph, marked the first time in 13 meetings that a Packers-Bears game was decided by more than 14 points. For more on that recent history in the series and what this game means for both teams, check out this week’s “One last look” preview.